Halloween and Bonfire night are over and done with for another year, we start thinking about Christmas. As parents we tend to think about it a lot earlier mainly because it can get rather expensive with a child. I know some parents pick up bits from the sale since summer to make it more affordable when you spread out the cost of buying. I have put together a few bits we will be putting in my girls Christmas stocking starting with a beautiful large children's personalised Christmas sack from my 1st photos. It's definitely worth investing in one of these from when they are born rather than buying the plastic sacks which isn't environmentally friendly. These sacks will last you many years to come and you can get their names printed on along with a photo of your choice. One for each child and fill it all up! My girl loves baths so a set of new bath squirts always goes down well and we have the Tractor Ted bath squirts this year. Also from the Tractor Ted range is these magic painting books which she loves and I love because they are re-usable. You just add water to the pen and colour in the pictures and colours will magically show up. When the page is dry the colour will disappear and you can do it all over again! I particular like taking these out with us if we are eating out in a restaurant as it keeps her occupied. Isn't every child mega into all these what I call waste of money toys where you don't know what's inside and they just love the "not knowing" and opening them up and you end up with lots of these little toys around the home. She absolutely loves these ones called Party Popteenies. You twist them and they pop out like party poppers with lots of confetti...and yes lot of mess!!! 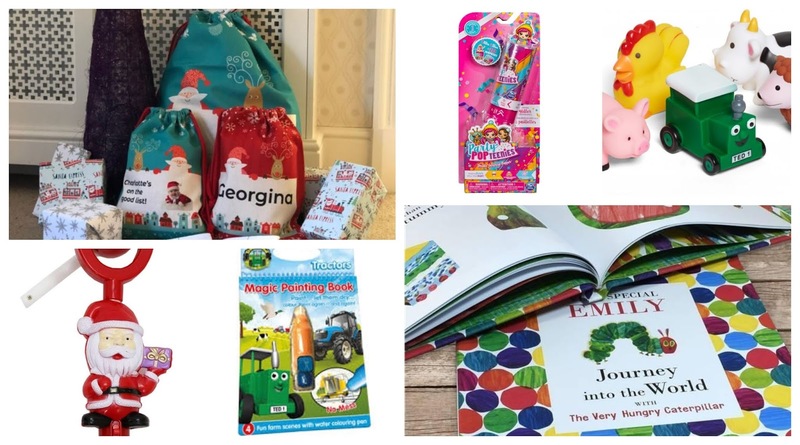 Every kid has a book in their stocking and this year we decided to get a personalised one with the very popular classic The Very Hungry Caterpillar - Journey Into This World from Personally Presented. This website does some wonderful personalised gifts which would make great presents for any family / friend. Our book we got is personalised with what ever you want, we decided to put the little ones name and a short msg from mummy & daddy and dated it. Santa light spinner, I picked one similar from the Card Factory last year for a few quid and it was the only present she was interested in the entire day. It actually made me think why bother buying anything else so this year I will look for a similar one. I will include other bits in like chocolate, stickers, clementine, hair ties and one or two other random bits as I find them. Once you have children Christmas really is all about them and you are less bothered about yourself. I can't wait to see her face when she opens up all the presents now that she's more aware and understand this year!